Suckers for Bejeweled-style puzzle games are in for a treat with Nintendo’s Spin Six, a game based off that game's fundamental design with a numerical twist. Like other puzzles games in the past, it’s a simple design with lots of replayability but the addicting puzzle mechanics and the cheerful presentation screams “Nintendo,” and ends up being lots of fun. Spin Six works like this: each puzzle is split into a giant rectangular box with cubes filling the interior. Instead of matching shapes with only a two-directional move, you rotate a block of four cubes in either a clockwise or counterclockwise direction, similar to Bejeweled Twist. The difference is this: say you wanted to join the number 3, you would then have to join three of them together. The same with 4, you would have to connect four of them in sequence. You can also rotate other cubes while your past match is still processing which is called a chain. The more chains you create the higher your score goes. It’s a clever match-style design that eventually becomes devilishly difficult. There’s a lot of varying modes to choose from like Time Attack or Puzzle, but once you get past the beginning stages you’re quickly thrown into tougher scenarios. 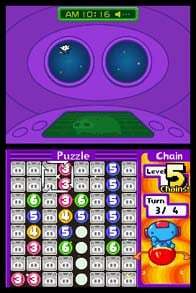 The Puzzle mode, which only gives you one opportunity to nail all of the numbers in one consecutive chain, is probably the most enjoyable as it tests your patience as well as your skill. The other modes are pretty fun too, but many of them will become so difficult you may want to only do a couple of puzzles per day. When you boot up the game for the first time it lacks a mandatory tutorial, instead, Nintendo opted to have it buried at the bottom of the main menu. This is an odd design choice because of the complexity of the varying puzzles. If you happen to choose the tutorial it’s quick, straight-to-the-point and informative; you’ll likely get the hang of the game pretty quickly, and none of the fundamental gameplay is difficult to understand. Another odd design choice was to completely ignore the touch screen as Spin Six only uses the button and directional pad. Such a fast-paced, quick-thinking puzzle game succeeds with good touch screen control but the game doesn’t use it, not even for the menus. Though this was only a small gripe in terms of its overall production, as the game still works perfectly fine without it. In fact, they may have got rid of the touch screen control entirely because the buttons are far easier to use. 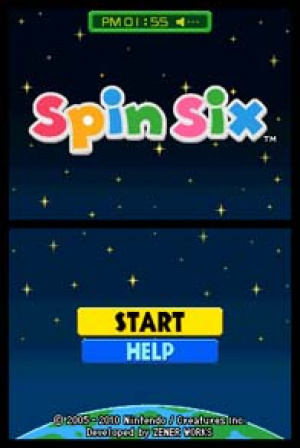 Spin Six has a quirky presentation that almost seems like a WarioWare game in terms of craziness. After you complete some of the puzzle-oriented levels, characters like to spill out random facts about the earth. Did you know that an ant can have up to 200 small naps per day? Like a Snapple bottle cap, the things Spin Six teaches you are completely random, but they are fun to read. 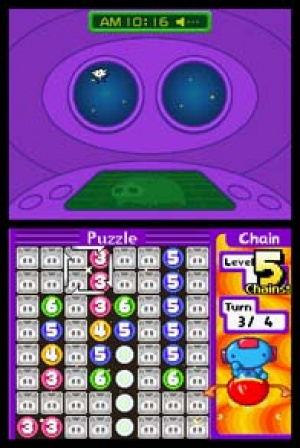 The visuals are bright and colourful while the puzzles have a sharp design. 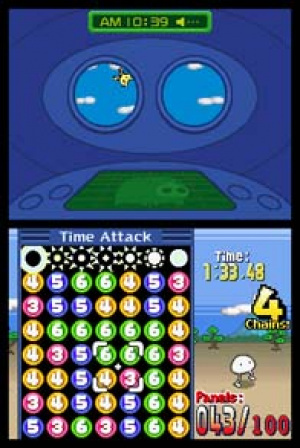 The game also features a cheerful soundtrack with appropriately absurd sound effects. Spin Six could’ve used a good online leaderboard system to compare scores and times with friends, but you can still keep track of your scores offline. There’s also quite a bit of puzzles to complete, plus there are many difficulty settings for every mode. 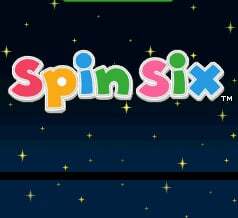 Bejeweled-style puzzle games are addictive, and Spin Six is a very good example of why. It offers a lot of clever, time-sucking modes that may surprise you with their complexity. And though the game may not be outstanding in any specific area of its overall production, Spin Six is still well worth 500 Points. Been having fun with this since Monday. I was trying to figure out what the look of this game reminded me of, and it was indeed WarioWare. Nicely done review. Correct me if I'm wrong, but I fail to see any reference to Nonono Puzzle Chai-Rian on the GBA, which either is the predecessor or the exact same game. I'd be really interested in knowing whether Spin Six offers anything new or is just yet another cartridge-to-download port I've already enough with. This one came out alongside Super Swap? AND it's made by Nintendo? I hate to be a first-party fanboy...but maybe this is worth my download more than that one. Gah, now I can't decide. Curse you Nintendo for complicating my simple decision to get Super Swap. @KeeperBvK. I for one don't remember a time attack in the GBA game (also the walking game with the moving platforms and the microwave game aren't present in the DSiWare game) and the vs mode stuff could also be missing but apart from that it looks like it could be the same. A little disappointed with this entry, I feel it is more of a 6/10 then 8/10. When I downloaded it I was expecting a title similar to a PSP mini download called Numblast which is extremely addicting (imo). Perhaps after a bit more time I will see it in a different light, But for now 6/10. Just become a Club Nintendo award. Sounds from the reviewer like something worth picking up, though a few readers @slidecage and @yodude don't seem to be fans. @XCWarrior Haha, I popped over here to read the review too. Think I will use some coins for this haven't used my rewards in a while . i think i played it for an hour and then just tossed it back on the memory card. When you learn how to properly play the game you will see how addicting it is. It has a fast gameplay if you know how to make chains (it's like "combos"). At first I didn't enjoyed it too much, but after I get used with the gameplay I can't stop playing.